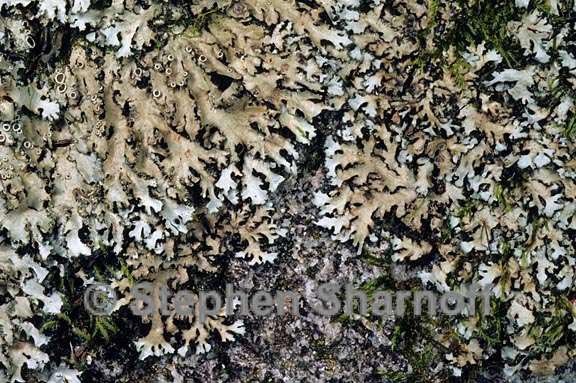 Thallus: foliose, up to 11 cm in diam., sometimes coalescing into even larger thalli, irregular to +orbicular lobes: discrete or irregularly rounded and partly imbricate, (1-)24(-6) mm broad, distinctly concave and usually ascending somewhat at the end (rhizines of the lower surface nearly always visible and conspicuous from above, a few along each lobe usually mounted on the lobe margin and projecting almost straight upward) upper surface: gray to gray-brown or brown, usually dull, rarely weakly shiny, epruinose but rarely with a thin patchy epinecral layer, sorediate/isidiate soredia/isidia: granular to isidioid or occasionally irregularly lobulate, sometimes primarily laminal and remaining +granular, most commonly marginal or submarginal upper cortex: paraplectenchymatous medulla: white lower cortex: paraplectenchymatous lower surface: black, sometimes paler at the lobe ends, dull; rhizines: mostly simple, but often some older ones becoming sparsely squarrosely branched, black Apothecia: infrequent, up to 2 mm in diam., sessile; margin: entire or sometimes irregularly crenate, often bearing a dense corona of rhizines ascospores: ellipsoid, 18-25(-28) x 7-12(14) µm, Physcia-type Spot tests: all negative in cortex and medulla Secondary metabolites: none detected. Substrate and ecology: common on both bark and rock World distribution: North America, Europe and Africa Sonoran distribution: common in Arizona, Sonora, and Chihuahua; infrequent in Baja California and Baja California Sur. Notes: Structures for asexual reproduction in Phaeophyscia hispidula are very variable, from more or less orbicular, laminal soralia with granular soredia to primarily marginal/ submarginal clusters of strongly isidioid propagules, some of which occasionally even become lobulate. Intergradation between these various types is complete. The typical large and wide-lobed specimens are easily identified, but in parts of the study area, there are frequent, primarily epiphytic specimens, which are often smaller and with narrower lobed, overlapping in size with the many smaller species of Phaeophyscia. Still, they can be rather easily distinguished by their distinctly concave lobes and the numerous long rhizines (a few, at least, weakly squarrose), some of which project upward along the lobe margins.